Several of the area’s most respected cocktail bars are embracing rum this summer, giving the sometimes maligned spirit its moment in the sun and providing guests with a jolt of bold and sweet flavors to match the season’s sizzling intensity. Perhaps spurred by the success of the Miami Rum Renaissance Festival and a growing respect by mixologoists and serious drinkers, rum is poised to break away from its stereotypical niche and reach a broader audience. It’s the prefect fun summer spirit, and it offers many ways to enjoy its versatility. 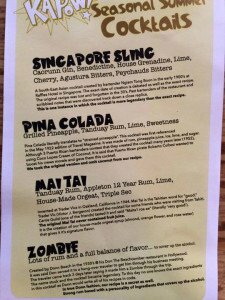 Bar Stache in Fort Lauderdale is offing the most ambitious summer events, dubbed Rum Takeovers. They kicked off July 9 with a Rhum Clément tasting and drink demo by Nick Nistico. 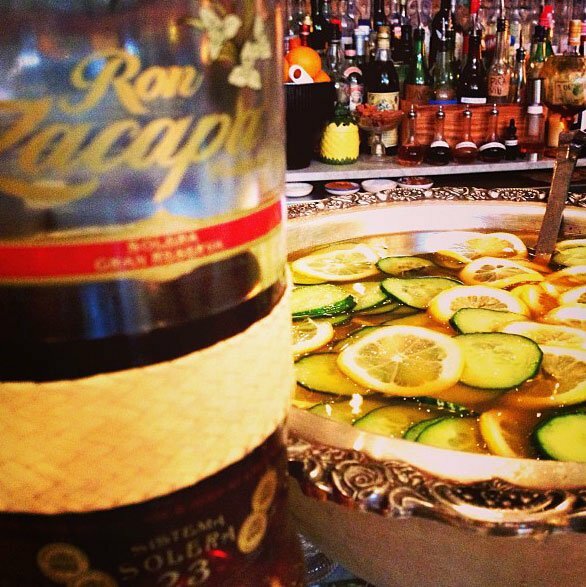 Then on July 23, Ron Zacapa from Guatemala was featured along with artesian cocktails by Brijette De Berardinis. Aug. 6: brought Brugal from the Dominican Republic, presented by Bar Stache mixologist Brian Sassen. On Aug. 13, Freddy Diaz of AlambiQ Mixology in Miami brought some of his signature cocktails featuring Mount Gay Rum, joining brand ambassador Karlene Palmer-McLeod. These Wednesday night tastings (from 6:30 to 8:30 p.m.) feature not only some of the top rum brands in the world, but also include cocktails created by special guest mixologists who will also answer questions about each brand. RSVP to vip@stacheftl.com. Bar Stache, which opened in November in downtown Fort Lauderdale, was recently named Best New Bar by Broward Palm Beach New Times. Billed as a “1920s drinking den,” the large venue occupies the 5,000-square-foot space (formerly the Green Room) next to Revolution Live and America’s Backyard and also shares the same ownership group. 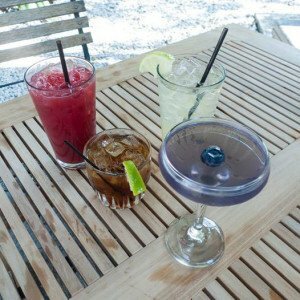 It’s quickly establishing itself as the go-to spot in Broward County for well-crafted pre-prohibition cocktails and was mentioned by Zagat as one of the top 10 hottest bars in the Miami area. Kapow! Noodle Bar in Boca Raton has been a unique treasure in South Florida since opening in November 2011, praised by both critics and hordes of fans. The small and colorful establishment in Mizner Park has taken home a boatload of awards from Broward Palm Beach New Times, including Best Cocktail Bar, Best Happy Hour, Best Cocktail, and Best Bartender. Mixologist Angela Dugan deserves all the acclaim for crafting seasonal menus that always offer surprises and unique tastes. But I always got the feeling that she wasn’t a huge fan of rum, and I rarely saw it featured in Kapow cocktails. Well, Dugan has more than made up for it with her 2014 summer menu. 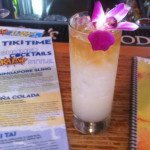 Mai Tai: Lighter and fresher than the traditional version of the Trader Vic’s classic. A distinctive orgeat flavor and aroma dominates, and the floater of the stellar Appleton Estate Extra 12-year-old rum is a nice touch that lends both taste and visual appeal. I do miss the traditional mint, though. But the orchid garnish is a nice touch and totally fits the Kapow style. 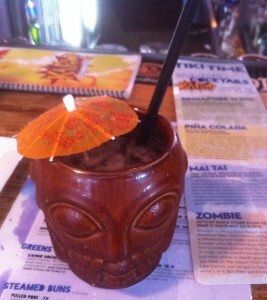 Zombie: More like inventor Don the Beachcomber’s more accessible 1956 version than the deadly 1934 original, this potent concoction is dominated by a very nice homemade falernum, plus three rums. 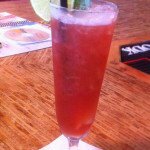 Also, like the Mai Tai, it’s refreshing and well-balanced thanks to the fresh lime juice. I spotted three rums going into the ominous mug (Tanduay light and gold from the Philippines, Mekong dark from Thailand). The lack of a traditional 151 rum makes this less deadly (Mekong is actually less than 80 proof), but there’s still plenty of flavor and firepower. The cool mug is imported from China in keeping with the Asian theme. Pina Colada: Sour and bright, more like a pineapple daiquiri, this is based on the pre-Coco Lopez recipe with no creamy elements. The muddled pineapple combines with the lime and just a touch of sweetness to create more of a sour than a sweet drink. It relies more on the natural sweetness of the pineapple than added sugars. And the grilled pineapple (with coconut) is a creative (and tasty) garnish. 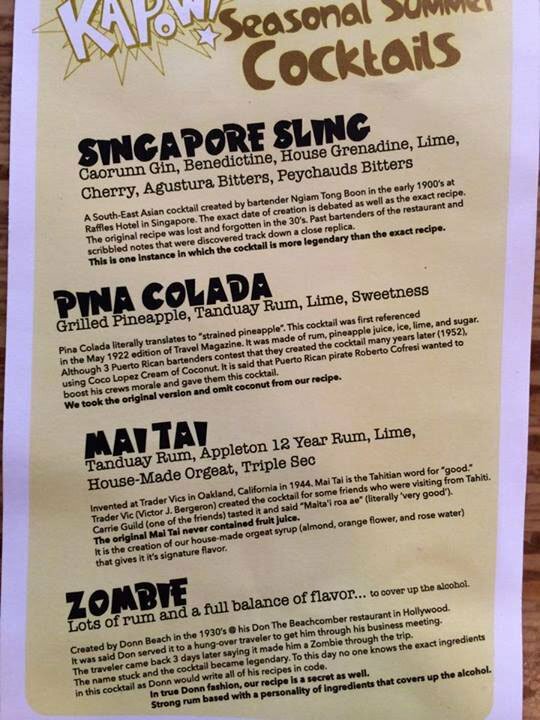 Singapore Sling: The only non-rum cocktail is the most true to the original, which really was created in southeast Asia. It features an outstanding gin (Caorunn, a small-batch Scottish gin) and traditional flavors (lime, Benedictine, grenadine, bitters, etc.). Very smooth and not as bracingly strong as some Sling recipes. Yet another great garnish (lemongrass) makes for perhaps the most distinctive looking of all the selections. These drinks, while not exact replicas of the originals, perfectly fit the aesthetic of Kapow. And they share enough traits to make them worthy additions to the canon. They also pair perfectly with some of Kapow’s tasty small bites, such as steamed buns and dumplings. Dada, like “sister restaurant” Kapow (both are owned by Rodney Mayo’s Subculture group), is first and foremost a restaurant. And a pretty excellent one at that. Broward Palm Beach New Times readers recently voted Bruce Feingold best chef, and in February he won the Iron Chef-style cooking competition at the Delray Beach Garlic Fest for the second year in a row. As a result, the cocktails at this laid-back venue – built into a historic house near bustling Atlantic Avenue – are sometimes overlooked. The restaurant opened in 2000 [see history and review], and has long been known for its well-crafted mojitos. But as we found out in March [see review], last summer’s addition of craft rum cocktails has elevated the drinks to near equal footing with the food. The rum cocktails, both new and classic, have happily become a permanent fixture. And a new round of drinks was added in late April featuring Dada’s house-made small batch spiced rum and house-made bitters. These include the Gringo Cuba Libre, the Bruised Ego, and the Drunk Monk. 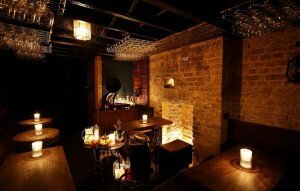 Dada also offers some excellent premium rums for sipping, plus rum and cigar pairings for smokers. This is one establishment that truly offers something for everyone. 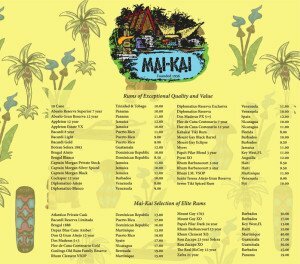 The Mai-Kai’s new rum menu. 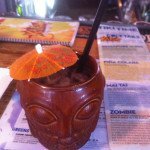 No discussion of rum in South Florida would be complete without a mention of The Mai-Kai, the 57-year-old historic landmark in Fort Lauderdale that has been serving up some of the best rum cocktails in the world for generations. 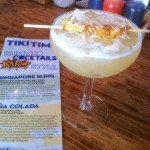 Many of the secret recipes date all the way back to the 1930s and Tiki bar pioneer Don the Beachcomber, but if you read this blog regularly you probably know all that. 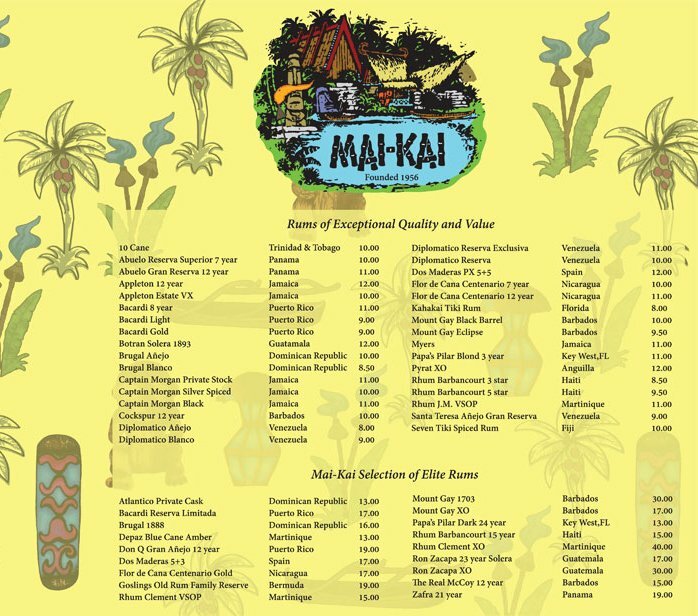 Check out our Mai-Kai Cocktail Guide if you haven’t. The expansive new cocktail menu, launched in January [see story and review], includes not only 47 classic rum cocktails, but it was also expanded to feature an extensive list of sipping rums. You can choose from among 51 impressions, including everything from Appleton to Zafra. 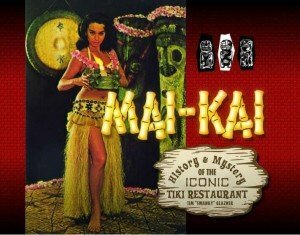 The restaurant is a full sensory experience, from the legendary Polynesian Islander Review stage show to the classic Cantonese food and flaming deserts. But it’s also possible (and encouraged) to just sit back in The Molokai bar and relax with a refreshing (and potent) tropical drink and/or a sip of rum. It’s the closest you’ll get to paradise. Not to be ignored in the vast South Florida spirits universe is the sprawling Miami-Dade County, which includes a dizzying smorgasbord of global restaurant and bar experiences, many with a focus on rum. Since that part of the region is not our strong suit (The Atomic Grog crew typically frequents Palm Beach and Broward establishments), we’ll turn to our friends at the Miami Rum Festival for some guidance. 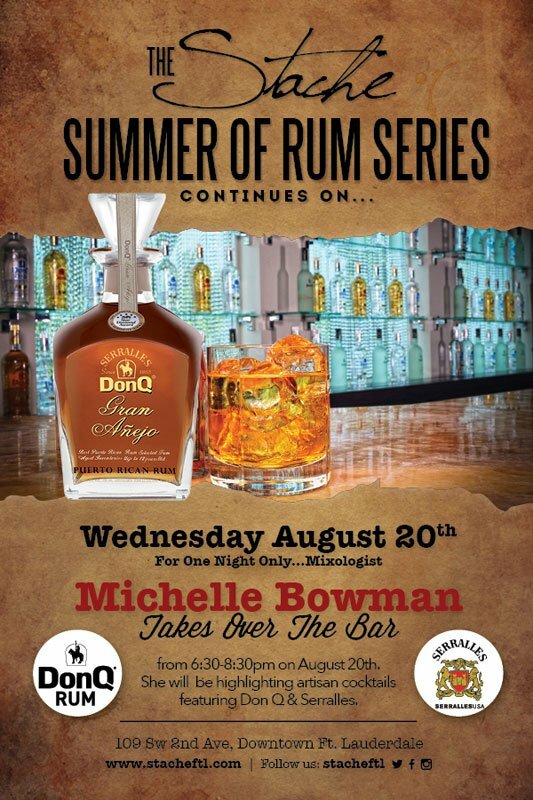 Starting on July 10, festival organizers Robert A. Burr, Robin Burr, and Robert V. Burr began hosting a series of monthly tastings in Miami with a sampling of the finest luxury rums from Panama. The events, which typically cost around $20, are held at the Impressions Restaurant at the DoubleTree Miami Hotel. Future events are scheduled right up through next year’s festival and include Aug. 14 (Rums of Barbados: Mount Gay), Sept. 11 and Oct. 9. 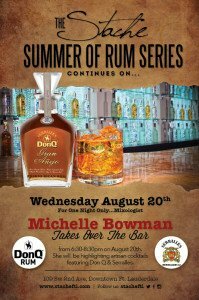 Click here for more info or e-mail RSVP@RobsRumGuide.com to reserve a spot. Perhaps you’re just looking for a leisurely night out to taste some rums and cocktails. Burr, who publishes the online Rob’s Rum Guide with his wife and son, has some advice. In this interview with Forbes Travel Guide, he recommends The Broken Shaker on Miami Beach, The Regent Cocktail Club at the Gale Hotel on South Beach, Radio on South Beach, Ortanique in Coral Gables, and Gramps in Wynwood. We’re also looking forward to the second Miami Cocktail Week as part of next year’s rum festival for more opportunities to try new venues. Postscript: Rum’s sordid history of pillaging pirates and lousy drinks at tourist bars has been hard to overcome. But the spirit has been making great strides lately with premium products, and it’s finally being embraced by craft mixologists. This momentum, along with the longtime support of Tiki enthusiasts, will hopefully help chip away at the dominance of vodka as the most popular spirit in the United States. For a deeper dive, check out the “Rum sites & blogs” among the links on the right rail of this blog, and click on the links below. Just be sure to enjoy responsibly. This entry was posted in Cocktails, Cocktails, Events, Mai-Kai, Rum, South Florida and tagged AlambiQ Mixology, Bar Stache, Broken Shaker, Brugal rum, cocktails, Dada, Don Q rum, Fort Lauderdale, Freddy Diaz, Kapow!, Mai Tai, Mai-Kai, Miami Rum Renaissance Festival, Molokai bar, Mount Gay rum, Pina Colada, Robert Burr, Robert Burr's Rum Guide, Rodney Mayo, Ron Zacapa, rum, Singapore Sling, South Florida, Tanduay rum, Zombie cocktail. Bookmark the permalink.